Don’t cheat on your wife. Just don’t do it. It’s wrong, it’s hurtful. 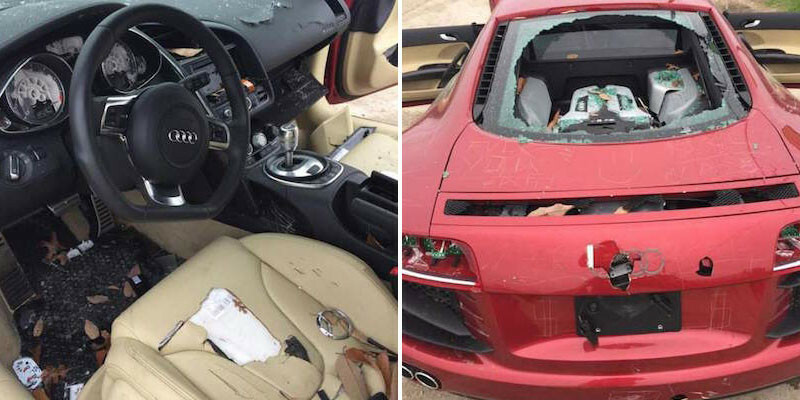 This £94,000 Audi R8 was heavily damaged by a wife after she found out her husband was cheating as you can see she put a lot of effort into destroying the supercar. Aside from the usual keying, this R8 has also lost its headlights & taillights while the windows were shattered. Even the badges and license plates are gone while the rear spoiler has been ripped off. It’s the same story on the inside where just about all dials were removed, the infotainment system was extracted from the dashboard, the leather upholstery was cut, the buttons for the adjusting the seats were pulled out and there are some wires hanging from the roof.